The year of the pig is globally red. 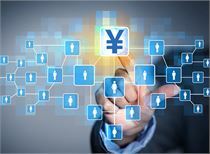 On February 11th, the first trading day after the A-share festival ushered in a good start.Shanghai indexUp 1.36%,GEMThe Hong Kong Hang Seng Index closed up by more than 3%, and the Hong Kong Hang Seng Index closed up by 0.7%. The trend of the US economy and US stocks undoubtedly laid the global market atmosphere. In 2018, US stocks fell from the peak to the cliff. The S&P 500 index was over 20% from the peak of 2940 in the third quarter of last year, and it was 2346 points in the "Bloody Christmas". In 2019, the situation of short covering has been fierce. The S&P 500 has rebounded nearly 15% from the low of December 26, and the Nasdaq has risen by 20%. What is behind the violent fluctuations? Can the US stock feast continue? At the beginning of 2019, the Fed hinted that the suspension of interest rate hikes and better-than-expected earnings quarters were the triggers for the rebound in US stocks. In the future, the profit trend will be the top priority. According to the latest quarterly financial report, US stocks are expected to achieve double-digit earnings growth for five consecutive quarters. 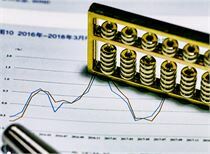 However, the profit outlook for the first quarter of 2019 is not optimistic. The market currently expects a profit of -1.2% at the end of the first quarter, a record low since the beginning of 2016. 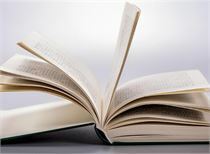 Situ Jie also told reporters that the first quarter of this year may be the period when the US stock market rebounded the most. After the pressure of investor shipments and the “selling in May” market, the US stocks are likely to fall into consolidation again. “After all, long A bull market of 10 years, it is not impossible to consolidate at a high level for 2 to 3 years." In 2018, global assets almost fell, and the US stocks that had been strong for half a year were once "safe haven assets". However, they finally could not hold back in September last year. In October last year, the global market rallying made the US stocks pull back nearly 10%; by December, the traditional "Christmas rally" was cool, the S&P 500 index fell to a 19-month low, and the decline was fast and fast. Unexpected. As of December 25, the US Dow fell below the 200-day moving average, the worst Christmas Eve performance in history. "Under the 'G20 Consensus' at the beginning of December last year, the market has soared, and a lot of funds have rushed into the bottom, but it is obviously a copy of the bottom of the mountain. In the near future, the US stocks turned down and fell to the 100-week moving average. This is also an important support. Then, computer-based algorithmic trading began to sell automatically, and the selling pressure continued to intensify. The market was dragged to the 200-week moving average, and oversold was happening." Situ Jie told reporters. In fact, this oversold market has also superimposed multiple pessimistic expectations. First, the market had expected the US economy to enter a recession earlier. However, this is not true. The US economy is at most high, and the unemployment rate is still at a record low. In addition, the recent Fed’s attitude has turned into a strong shot for US stocks. On January 28th, Fed Chairman Powell sent a sentimental "apology letter" to the market, not only implying a moratorium on raising interest rates, but even hinting that it would end the contraction more quickly. As the voice just fell, the US stocks skyrocketed. The current mainstream view is that the Fed will raise interest rates 1 or 2 times in the second half of this year and will not raise interest rates next year. At the same time, the performance of the US stock market was still good, and there was no “profit decline”. As of now, nearly 46% of the S&P 500 companies have reported their fourth quarter earnings for 2018, and 70% have reported more than expected EPS growth. "January, ApplePerformanceGuided by the thunder, it fell 8% on the day. After that, the market began to digest. The company reported better-than-expected earnings in the fourth quarter of last year, and the Fed hinted that the interest rate hike was suspended, which also aggravated the rebound. Situ Jie mentioned that earlier Apple sent a letter to investors, due to the unexpected slowdown in China and other markets, it is estimated that the first quarter of 2019 revenue will be 84 billion US dollars, after the guidance of 89 billion to 93 billion US dollars, down the hairinterest rateTo 38%, it is the lower limit of the guidance interval. In the year of 2019, due to investors' psychological preparations, Apple's fourth-quarter earnings report released its earnings rose by nearly 6%. "So, a crazy short covering appeared in January this year," Situ Jie told reporters. "After overselling, investors have started to buy back. In terms of pure technical analysis, the S&P 500 index is very May return to 2800." As of February 8, Beijing time, the S&P 500 index closed at 2,707 points. It can be said that the current rebound in US stocks is expected, but the speed and rebound of the occurrence are greater than expected. 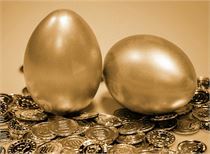 Morgan Stanley, the most accurate investment bank forecast last year, currently believes that by the end of 2019, the target price of the S&P 500 index will be 2,750 points, corresponding to a price-earnings ratio (PE) of 15.5 times. This also means that the current rebound of US stocks is difficult to achieve. "On February 9th, Apple announced that the five-year retail business executive is in order to change the pricing strategy. In the short term, it may boost Apple's stock price, but it can't change the reality of smart phone saturation. Therefore, after the market is closed, it will still face higher in the former high. Great pressure." Situ Jie told reporters. In addition, he also mentioned, “Now it is very similar to 2011 and 2012. In 2011, the European debt crisis broke out. US stocks plunged from the summer of August. In September, they fluctuated sharply at the bottom. In October, they officially bottomed out and began to sharpen in November. Rebound, and began to call back in December. Before January 2012, almost all traders were extremely pessimistic about 2012, and similar pessimism I saw in 2008." Then in the first quarter of 2012, US stocks soared by 15% (very similar to the current rebound). “The trigger is that Germany and Greece have reached a plan to reduce spending. At that time, Apple led the gains, rising from 300 to 400 in just a few months. 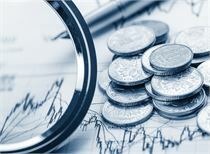 Near the US dollar, but the Greek debt crisis in April of the same year reappeared, the market has experienced a lot of shocks, erased all the increase, with the summer of the year shocked the city opened, the US stocks did not begin to rise until October of that year, followed by the US election. The current situation is exactly the same, because 2020 is also the election year." The judgment that US stocks will exacerbate volatility is actually based on multiple considerations. First of all, 2700~2800 points have been locked in many investors earlier, so the selling pressure is quite heavy. Secondly, the US economic cycle peaks at a high level, and the future earnings expectations will be difficult to surprise, so the new funds will be hesitant; According to historical statistics, the selling pressure of “selling in May” is indeed not small, because traders started summer vacations and market trading was light, and the worst drop in history often occurred in October. The Fed was once the sword of Damocles hanging over the US stock market. Now that the hidden danger is temporarily suspended, profitability has become the only important factor. 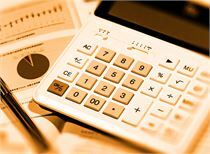 Although the financial report released in the fourth quarter of last year is still eye-catching, the profit outlook has sounded the alarm, and the pulling effect of tax reform has gradually declined. 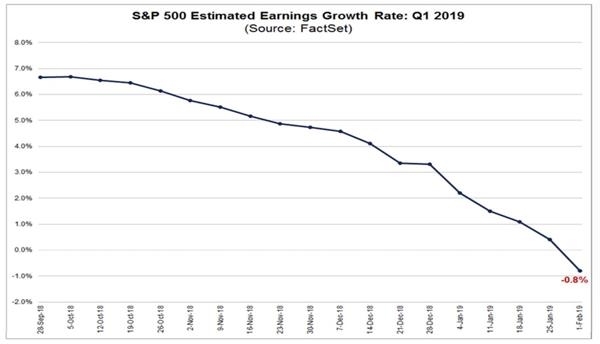 According to Factset, as of February 5, 33 S&P 500 companies have announced a negative EPS outlook for the first quarter of 2019, with only nine companies reporting positive earnings outlook. The data shows that the 12-month forward PE P/E ratio is 15.7, lower than the 5-year average (16.4), but higher than the 10-year average. Specifically, the S&P 500 constituents expect a bottom-up EPS forecast of 4.1% in the first quarter of this year (from $40.21 to $38.55). So, how serious is the 4.1% decline? 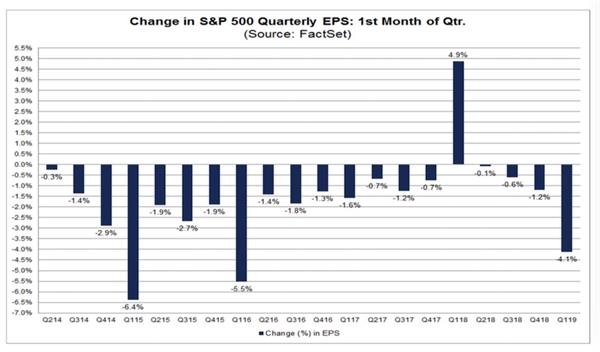 Factset said that in the past five years (20 quarters), in the first month of each quarter,AnalystThe downward revision of the bottom-up EPS forecast for the quarter averaged 1.6%; in the past 15 years, the reduction was 1.7%. As a result, the current 4.1% decline forecast has reached a 15-year high. “It’s just that there are no other 'performance mines’, including large technology companies and semiconductor companies. It’s also difficult for the S&P 500 to hit another 3,000 points. 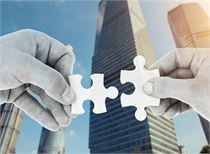 In this late cycle, the US stocks’ basic materials and energy sectors, There may be more opportunities for stocks and emerging markets,” Situ Jie said. As we enter the late cycle of economic expansion, stock volatility will inevitably rise, and the asset management agency will have to reduce the stock holding weight to make the risk value of the overall portfolio flat. Many institutions have judged that US stocks will not fall into recession, but in the context of high volatility and falling profit surprises, the cost performance of the configuration will be synchronized.